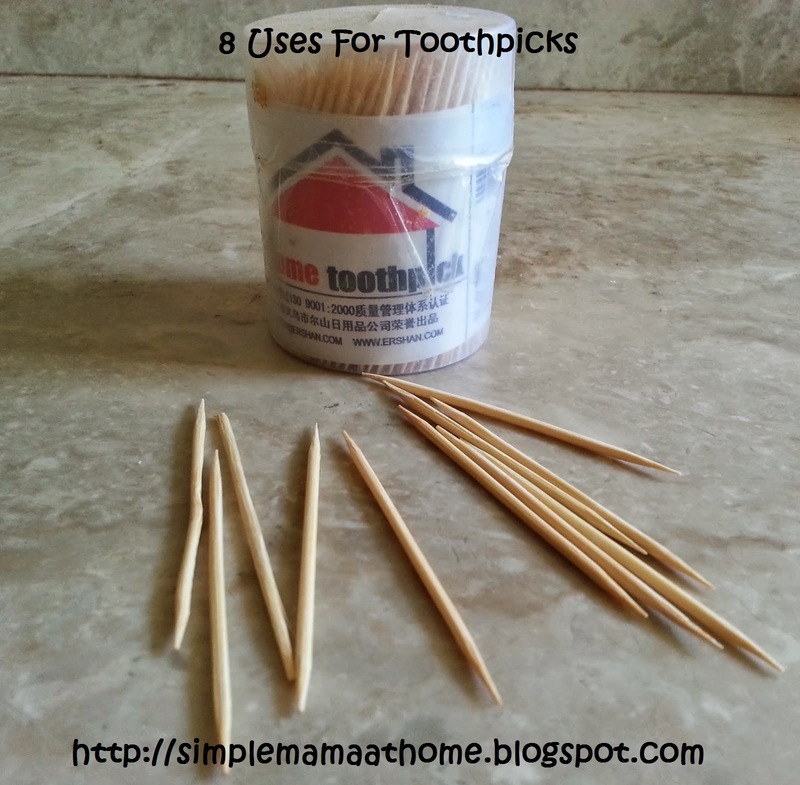 Toothpicks are a very inexpensive product and a must in any home. It is most commonly used to pry bits of food or other foreign matter from teeth. Actually there are also many other uses for toothpicks. I will share the uses that I have recently tested and can say really work. I will update this list according as I test more uses. 1. Clean dust and dirt from the cracks and crevices in a keyboard or telephone. 2. Clean dirt from under your fingernails. 3. To keep liquids from boiling over from pots while cooking place a toothpick in between the lid and pot to allow a little steam to escape. 4. Mark the end of a roll of tape by wrapping a toothpick at the end when finished using it. 5. Draft your cake icing design with a toothpick prior to applying icing. 6. Tighten and secure loose screws by inserting a toothpick into the hole, break it off level at the surface and then put the screw back. 7. Apply glue into small spaces or onto small surfaces such as ornaments. 8. Of course, one that you may already be aware of. Test a cake to see if it is done. Poke the center of a cake with the toothpick and if it comes out clean it means the cake is done. Have you found toothpicks helpful in other uses as well? Feel free to share! Don't forget cake tester :) That is what mine usually gets used for! I have also used to to break through the glue caked end of a bottle of white glue. Good luck on the list. I love the look of these toothpicks they are a lot thicker than some I have seen at the stores..plus some of them break and are very brittle when you try to test a cake to see if its done then the toothpick breaks and now you have a big hole in the cake. This is very useful information. I'd never thought of the keyboard buttons! Thanks for this! Sharing! Good ideas! I love the idea of using it for our keyboards! Why didn't I think of that? We also have the type of locks on the doors inside our house that you can pick by using a toothpick, so we use them for that as well - you know, when the kids accidentally lock themselves out of their room or the bathroom! I use a lot of toothpicks for various things but some of these ideas are new to me, I especially like marking the end of the tape. That seems to be a time waster for me! Oh my! I hadn't thought of using tooth picks for so many of these things! Like how to get the dust/dirt from in between the keyboard! So clever! :) Thanks for sharing this! I use toothpicks for craft projects. My three year old will spends hour's putting them into an orange!! These are all really great ideas! I hadn't thought of most of them! I really love the idea of using one between the top of a pot and the pot itself. Also tightening and securing loose screws? Genius! We use ours for crafting a lot as well as the regular intended uses. This is a great list adn very helpful!